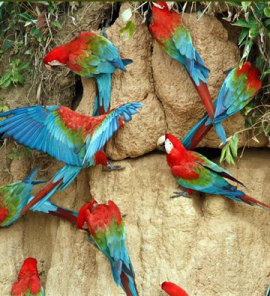 The Green-winged Macaw is a darker shade of red than the Scarlet Macaw and has a shorter tail. Both adults dark red in general; green middle wing coverts, scapulars and tertiary feathers; back, rump and tail coverts blue; blue tail with red tips. Upper mandible horn in colour with black on sides; lower bill grey/black. Cere bare and face white with evident red lines of feathers. Eye yellow. Immature as in adult but with shorter tail. Lower mandible grey with white at base. Eye grey. Strong voice but usually less harsh than Scarlet Macaw (Ara macao). Some calls low and strident; in flight prolonged. Other calls include yelping and cawing, or shrieking. Should have access to a large enclosure, 15m (49 ft) long in which to fly for part of the year. Soaked or sprouted sunflower seed; walnuts, peanuts, pecans, Brazil nuts, pine nuts; corn on the cob, banana, orange and other fruits. Complete kibble for Macaws. Large macaw toys, chewables (fir branches, heat sterilized pine cones, bird-safe, unsprayed wood), large perches, swings, ladders; regular bathing. Horizontal box, 16" x 16' x 48" (40.6cm x 40.6cm x 122cm) or 35 gallon pickle barrel, or 55 gallon barrel. Loss of habitat, hunting, unsustainable trapping for trade. E Panama and South America south to N Argentina. Formerly west to Caribbean slope; tropical zone of Colombia; lowland Venezuela; interior of Guianas; throughout Amazon basin of Brazil, eastern Ecuador, Peru and NE Bolivia. In Brazil, Mato Grosso and western Sao Paulo. Northern and eastern areas of Paraguay. Found in rainforest in north of range; in south more in drier, more open areas including floodplain forest, upland forest and dry woodland. Needs large trees for nesting. Found up to 1000m (3280 ft) in Panama, 500m (1640 ft) in Colombia, 1400m (4592 ft) in Venezuela. Includes fruits and seeds of various plants and trees. Forages for food in canopy. Nests in large tree cavities but also crevices in cliff faces. Generally in pairs or small flocks; less inclined to large congregations like Scarlet Macaws, but will associate with these and Blue-and-yellow Macaws. 2 to 3 elliptical eggs, 50 x 35 mm (2 x 1.4 in). November-April in Peru; January in C Brazil; December Surinam.